Labor splits from Zionist Union, leaving Tzipi Livni's Hatnuah on its own. Labor MK says party aiming for new alliance with Benny Gantz. The Zionist Union, a joint list of the Israeli Labor Party and the smaller Hatnuah faction, has broken up ahead of the elections for the 21st Knesset. 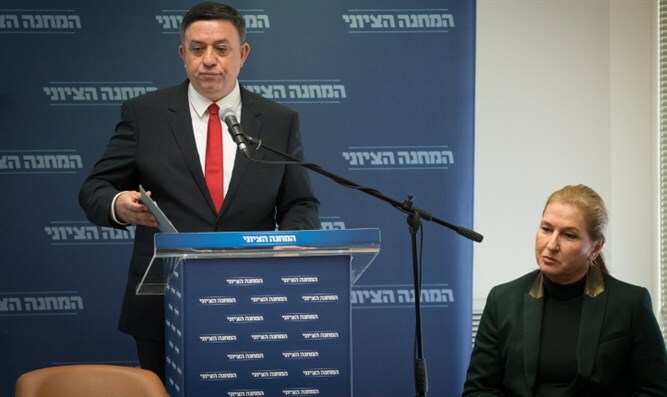 On Tuesday morning, Labor chief Avi Gabbay notified Tzipi Livni, chairwoman of Hatnuah and the senior partner with Gabbay in the Zionist Union, that he was ending the partnership between the two factions. "Tzipi, I wish you every success in the elections, in any party you choose," he said. "We will continue to fight and be committed to the change that the people of Israel want. I entered politics for the people and always be on their side." Livni, who was sitting next to Gabbay during the announcement but apparently had not been informed of the Labor leader's plans ahead of time, declined to respond immediately following Gabbay's comments. The split between the erstwhile allies comes just three months before this year’s Knesset election. The Zionist Union, which won 24 seats in 2015, has fallen in the polls to between 7 to 10 mandates under the leadership of its new chairman, Avi Gabbay, who previously served as Minister of Environmental Protection as part of the Kulanu party. According to Labor MK Itzik Shmuli, Gabbay split from Livni’s Hatnuah faction in order to form a new alliance with former IDF chief of staff Benny Gantz’s newly-formed Hosen L’Yisrael (Resilience for Israel) party, Yediot Ahronot reported.